Tryptophan is made available in the body through the ingestion of protein and its subsequent chemical interaction with vitamin B-6. Therefore, a deficiency in vitamin B-6 is likely to result in an inadequate supply of tryptophan. These two substances are converted to an essential neurotransmitter called serotonin. Since serotonin cannot be produced in the body without tryptophan, it is imperative that tryptophan be a part of a regular diet. The body uses tryptophan to help make niacin and serotonin. Serotonin is thought to produce healthy sleep and a stable mood, according to MedlinePlus. Dr. Walter Pöldinger and his colleagues, of the Psychiatrische Universitätsklinik, in Basel, Switzerland have conducted research that indicates that serotonin is instrumental in the prevention of anxiety and depression. Plentiful sources of tryptophan include bananas, dairy products, red meat, soybeans, shrimp, various fish, lamb, chicken and turkey. Any of these foods or combination of these foods will help to provide the recommended amount of tryptophan. 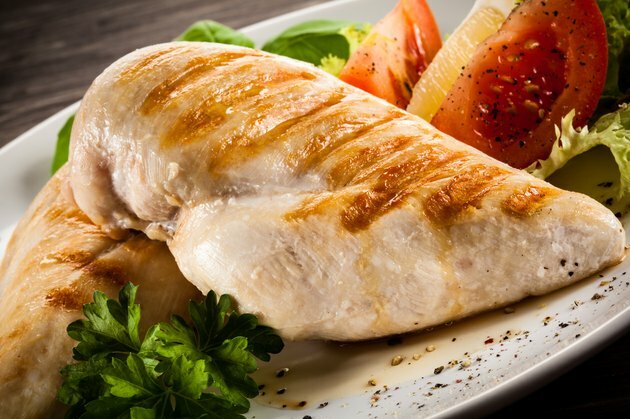 A chicken breast provides one of the highest levels of tryptophan at 390 milligrams in a 4 ounce roasted breast, with a 4 ounce turkey breast coming in at 350 milligrams. The same size serving of baked or broiled yellowfin tuna has 380 milligrams, while 1 cup of cooked soybeans has 370 milligrams. Tryptophan is sometimes used in alternative medicine as an aid to treat insomnia, anxiety, depression, premenstrual syndrome, ADHD and for smoking cessation. Not all uses for tryptophan are approved by the FDA. You should not substitute tryptophan for medications prescribed for you by your doctor. The Food and Drug Administration banned the import of tryptophan supplements due to a tragic situation in the 1980s in which roughly 5,000 people became gravely ill after ingesting an imported tryptophan supplement. The FDA prohibited the sale of tryptophan supplements in 1989, after 30 deaths were reported following the ingestion of a tryptophan supplement. However, these deaths may have been the result of product contamination, not tryptophan. At the time of publication, tryptophan supplements are readily avail over-the-counter. Before using tryptophan, you should talk to your health care provider. You may not be able to use tryptophan if you have certain medical conditions including liver disease, kidney disease, eosinophilia or a muscle disorder. You should also not use tryptophan if you are pregnant or breastfeeding without consulting with your doctor. Wellnessgoods.com: Do You Have "Serotonin Deficiency Syndrome?" Psychology Today: What Does Tryptophan Do? Strand, 2003.